Used the Rockwell saw to trim the thick layers on the side of the LG bulkhead. Then removed all the foam on the instrument panel above the leg holes with the scraper blade that came with the Rockwell saw. 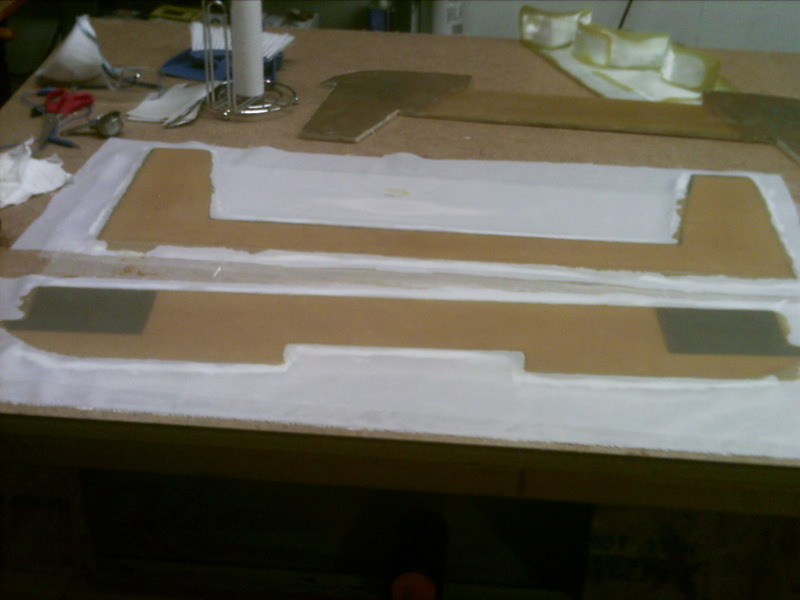 In place of the removed foam, I will be adding 3 layers of additional BID for extra stiffness. Used a belt sander to remove foam left over from the Rockwell saw, and finished up with a sanding block. Cut the sections of cloth in preparation for glassing. 3 BID over leg holes, 2 BID over all, and 1 UND over the leg holes to finish it up. Finished up with peel ply. Trimmed the next morning, with the exception of around the top section where the layers were thicker. I will finish up with the saw after cure. Glassed the forward facing LG bulkheads. 2 plys BID, 2 plys UND. Finished with peel ply. Glassed the aft face of the aft LG bulkhead. 2 plies BID, 2 UND horizontal, and 3 UND at a vertical angle to match the sides. Covered in peel-ply and let cure. Added a weight, as the middle was wanting to bow. In hind sight, I think this piece may have been correct before the weight, as after it was cured, I realized that since the sides have more ply’s and thus thicker, adding a weight to the middle actually produced a curve instead of straightening it out. I don’t think it will be an issue, but I plan to keep an eye on it during assembly. Trimmed the three LG bulkheads and sanded the edges of each. 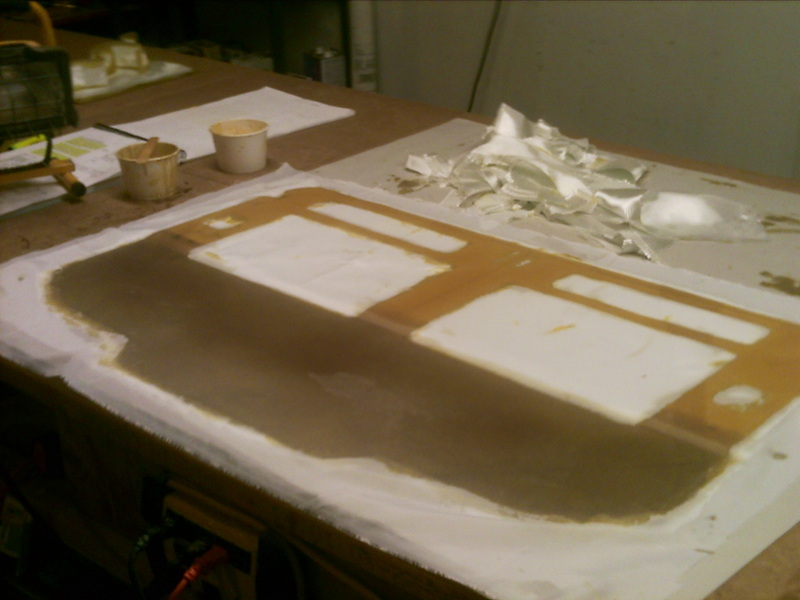 Then cut out some 1″ and 1.15″ strips of Last-a-foam. 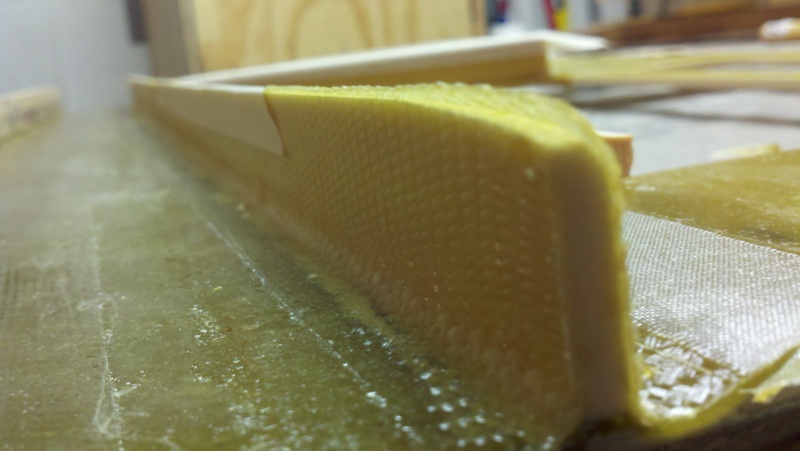 The 1.15″ pieces are to compensate for the foam that was removed from the forward facing side of the IP. 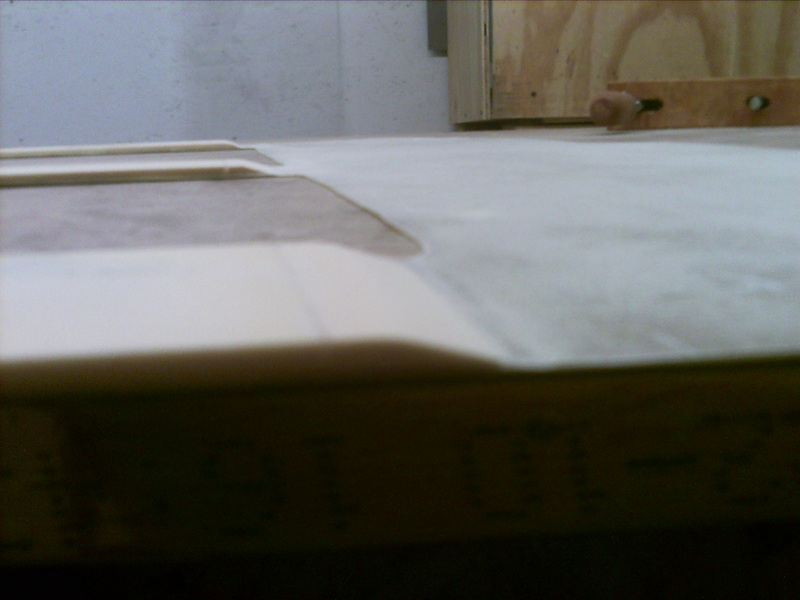 Cut out the temporary firewall from 1/4″ pine plywood. (none of the holes at this time though) Then moved back to the IP by adjusting some of the rib stiffeners to fit properly, and used 5-min epoxy to glue them in to place. Made up some 2″ BID tapes by wetting out a 9″ wide BID strip on to wax paper, and cutting into 2″ strips after placing a piece of wax paper on top. Completed one side of each of the rib stiffeners. 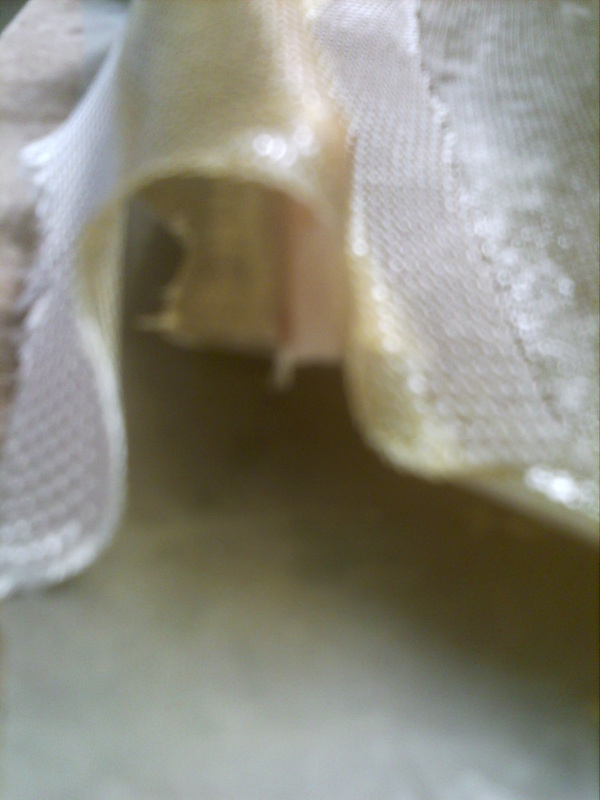 Started the BID tapes, and cut two strips of 2″. Micro’d the foam for the first rib and added dry micro in the corner. At this point I realized the 2″ strip doesn’t have enough of the BID tape draping over the edge to keep it down over the curve. Kind of like how a spike hair cut sticks up and won’t lay over because it was cut so short. I had a piece of BID tape that was uncut and about 3″ wide, so I pulled off the first one and replaced it. The 3″ tape still didn’t lay over that well, and I didn’t have any more tapes of the correct size made up, so I made the best of that one strip, and will come back to the others. I now realize why people were cutting wood pieces to lay next to the ribs to glass to. I cut my wood pieces to the proper thickness, added packing tape, and will continue glassing next time. 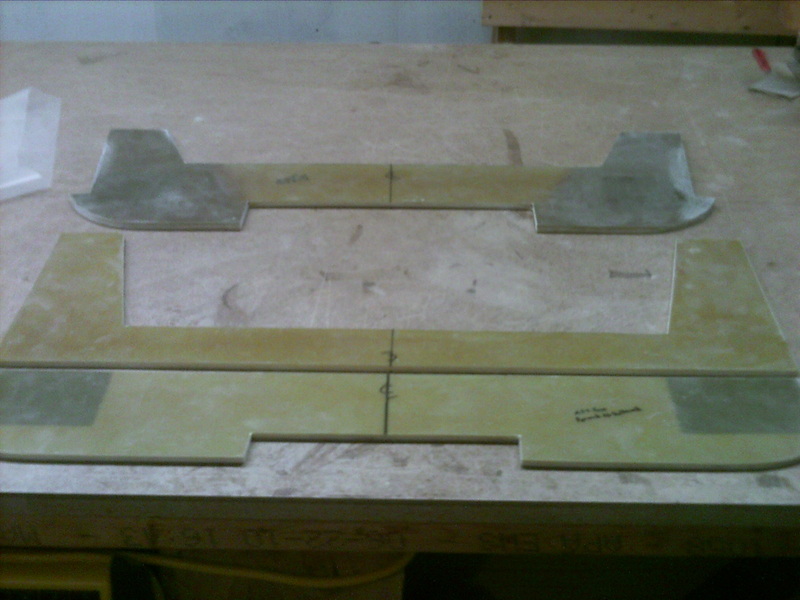 Glassed the rest of the stiffeners (2nd side), with the exception of the center, which couldn’t be reached until after trimming. This time I used the boards covered in tape trick to help keep the edges down. Once I started trimming at the knife trim stage, I noticed that the edges started popping up again. Since the glass was no longer tacky, I used some masking tape to keep it down till full cure, which actually worked REALLY well! 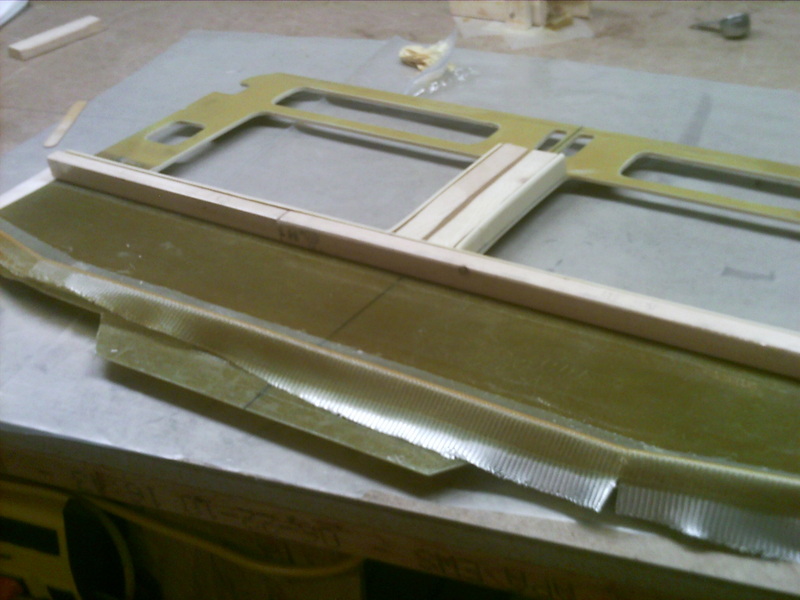 Glassed the 4″ middle section between the vertical stiffeners. Also used some of the left over dry micro to fill in some of the voids, where the glass didn’t stay down on a previous layup.